Avocado Pesto and Chicken Mexican Pizza. Walnut and avocado pesto pairs wonderfully with beans and chicken. 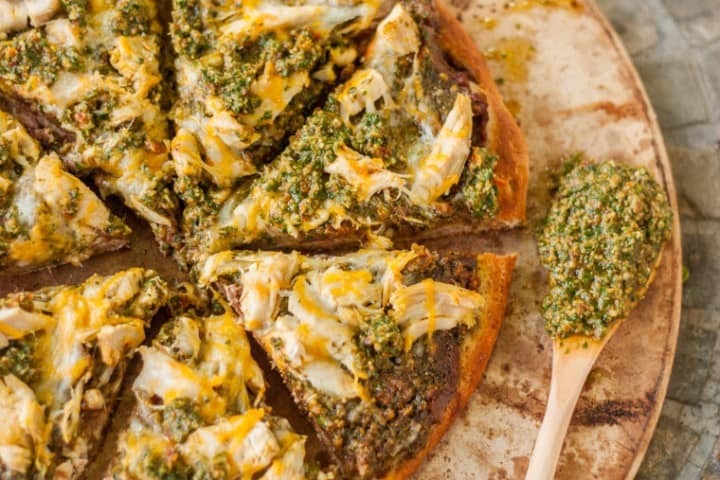 This is basically a burrito on a pesto pizza! As a food blogger, I’ve learned building a blog is much more than just good recipes, a passion for cooking, and the technical and creative skills to portray that. It’s about the writer, the reader and building relationships with an audience. Part of that is connecting with other bloggers and promoting. 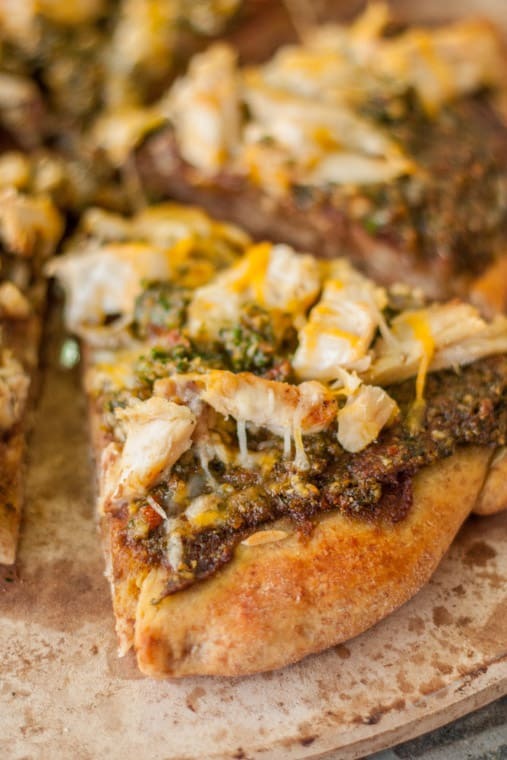 This Avocado Pesto and Chicken Mexican Pizza recipe post is part of a shared blogging promotion for Mayi Carles at Heart Made Blog and her new cookbook: Life is Messy Kitchen. In addition to creating recipes and valuable content for my blog, I’ll be promoting more to reach a wider audience. My passion is to get others as excited about food and cooking as I am. We’ll also be doing recipe and resources roundups. Back to the point of this post. Mayi was so kind to offer other bloggers the opportunity try a recipe from her cookbook, make it their own, and post about it. So here you go. In turn, she’ll list all the recipe posts on her blog in a roundup and share them on her social media accounts. It’s a win-win for everybody and a pretty smart idea. I’m happy to share my Avocado Pesto and Chicken Mexican Pizza recipe. It’s inspired by her Avo-Pesto recipe. I substituted walnuts for the pine nuts and made a Mexican inspired pizza. For those on special diets, use a gluten-free pizza crust, or omit crust all-together and make a bowl out of it. Avocado pesto pairs wonderfully with beans and chicken. This recipe is pretty adaptable. The toppings and amounts don’t need to be exact, feel free to make it your own. 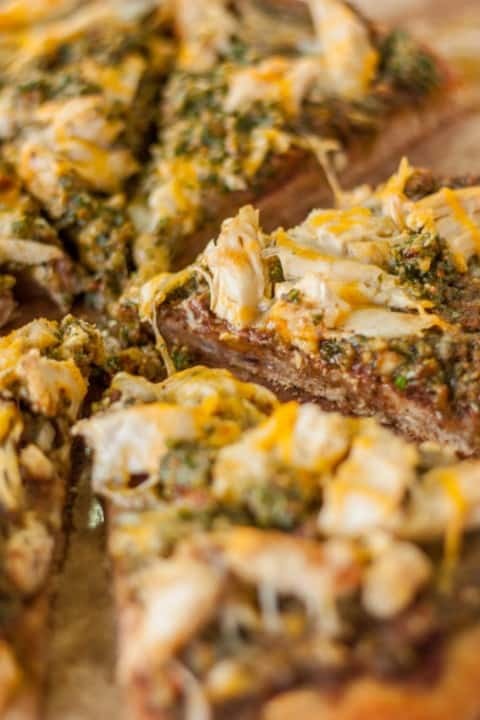 This is basically a burrito on a pesto pizza! I usually focus my writing more on the food and recipes, but think the ingredients are pretty straightforward, and the drool-worthy photos should be encouragement enough to make this Avocado Pesto and Chicken Mexican Pizza. I applaud you for making it this far if you are still reading this. Check out the recipe below and feel free to look around our blog for other recipes (with more descriptions, food science/cooking tips, and food photography tips on reach recipe) as well. I shot this in natural light at 1/100 sec, f/ 2.2, ISO 800. I baked this recipe on a pizza stone. It naturally had a wonderful rustic pattern and feel to it. For the main photography, I placed the baked, sliced pizza on a table that had a radial tile pattern and did an overhead shot; this compliments the shape and brings the viewer’s eye all the way through the scene. 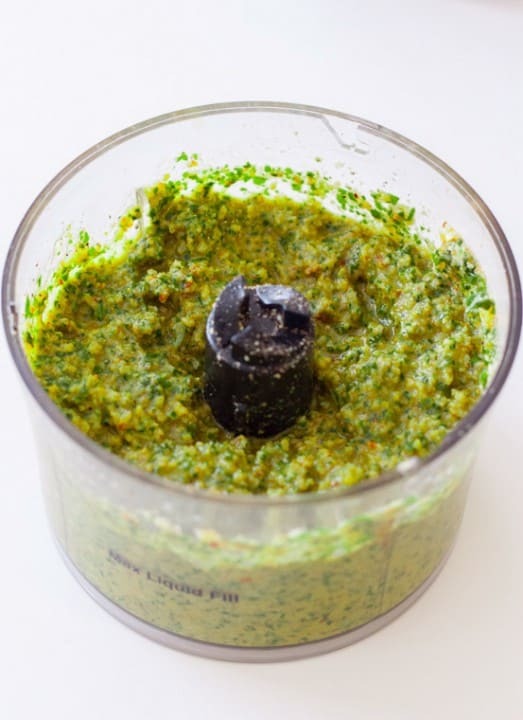 A spoon of pesto on the sides adds visual contrast and helps emphasize this main ingredient in the recipe. Note: You can barbecue or cook the chicken in a pan for this recipe. I provide instructions for both. Avocado Pesto and Chicken Mexican Pizza. Avocado pesto pairs wonderfully with beans and chicken. 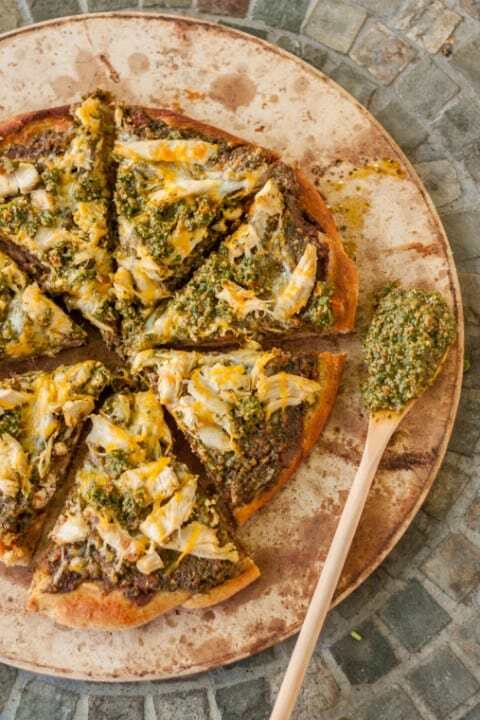 This is basically a burrito on a pesto pizza! Add basil, walnuts, avocados, lemon juice, garlic and salt to a food processor. Pulse until combined. Very slowly add olive oil and pulse, scraping sides if needed, until you reach a smooth consistency. To pan cook chicken: Cut into ½ inch strips. Heat olive oil in medium saute or non-stick pan to medium-high heat. Add chicken strips and sprinkle with salt and pepper. Cook 7-8 minutes, stirring occasionally, until completely cooked and opaque white. Remove from pan. To barbecue chicken: Heat grill to medium high heat. Sprinkle both sides of whole chicken breasts with salt and pepper. Place on heated grill, close lid and cook 5–7 minutes. Rotate chicken and cook 5–7 minutes more, until opaque white and just cooked through. Remove to cool slightly then cut into strips. Cook or heat pizza dough/crust according to package directions, then set oven to 425º F.
Evenly top cooked pizza crust with beans, then avocado pesto, then cooked chicken. Sprinkle shredded cheese on top. Bake 7-8 minutes until all ingredients are heated through and cheese melts. Slice and serve. Optional: top with sour cream. Thanks Sarah. Please do and I hope you enjoy! Hi Elsa. Thanks for checking out our blog and commenting. We really appreciate it. Hope you enjoy the recipe! Thanks Liz! Avocados add a unique flavor and make it more creamy. Glad you enjoyed the food photography tips and I hope you do keep coming back. What an amazing pizza, can’t wait to try this. My boys would LOVE it! Hi Matt. Thanks for commenting. I assure you your boys would love this pizza! 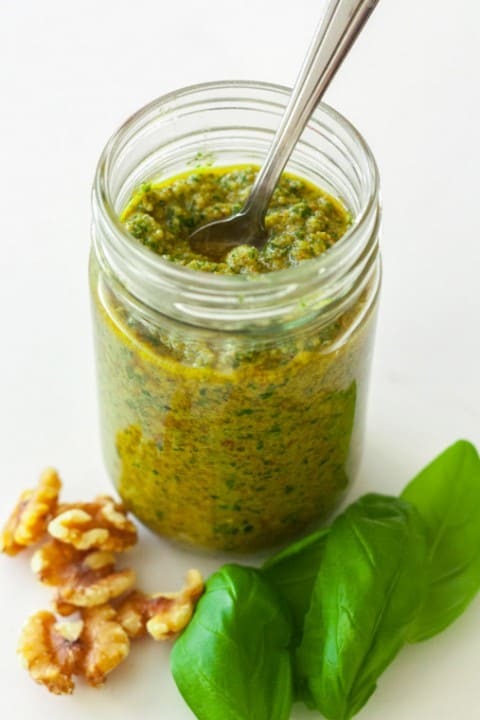 That Walnut Avocado Pesto is BRILLIANT! Love it’s use in this pizza! Thanks Shashi! I’m particularly proud of this recipe. The avocado pesto is a perfect sauce for the Mexican style pizza. Hope you like it.